All dimensions given in inches. For common diameters and wall thicknesses, see Page 6. Dimensions in accordance with ANSI B16.9 and B16.28. Other sizes, schedules and wall thicknesses also available. All dimensions given in inches. Dimensions in accordance with ANSI B36.10 which does not establish inside diameter. 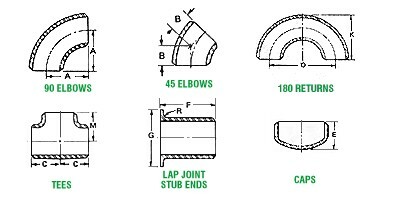 Wall thickness given is nominal and subject to mill tolerance.